When you think of Rolls Royce then chances are that you think of luxurious cars that are a dream to drive. Rolls Royce may not have the same stream of manufacturing as some of the other big names in automobiles, but they are still a name that everyone recognises. Here at Primo Registrations, we get more than just a little bit excited about the idea of a new car being released. Even if it is one that is a little bit out of our price range. Which is why we were excited to learn that there will be a 2018 Rolls Royce Phantom coming out. But what does the future hold for this epic release? Here is what we know so far. There is a reason why so many people have been excited to hear about the brand new Rolls-Royce Phantom release. 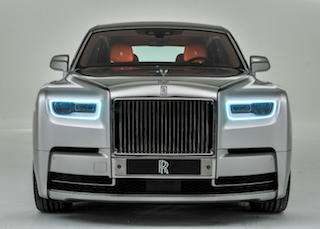 It has been 6 years in the making and is the start of a brand new look for Rolls Royces, built using some rather futuristic tech. An eighth generation of the Phantom, this particular 2018 release is being built under the careful ownership of BMW. Not only does it utilise some impressive tech, but it also has been completely redesigned and rebuilt from the wheels up. The decision to take this new turn comes from the companies boss Torsten Müller-Ötvös. Someone who realises that whilst the idea behind Rolls Royce is always going to be to provide quality and luxury. There is always a need to grow and change too. It features a twin turbocharged engine that boasts 6.75 litres. This is combined with style and elegance that is instantly recognisable with the Rolls Royce name. Whilst the engineering has some huge basis in BMW, the build and architecture of the car itself is 100% Rolls Royce. Something that seems to be an incredibly important point for Rolls Royce to clarify for its fans. Once the dust has settled on this particularly exciting release, then time will come for something even more exciting. 2019 is when Rolls Royce will be releasing their very first SUV, which at the moment is still known as Project Cullinan, and is sure to cause huge ripples in the industry when more information is finally known about this brand new branching out of the name. You might not be able to afford a Rolls Royce just now. But with our help you can make your car extra special. We are stockist of personalised number plates and we have a wide range of reg plates for sale. If you want to transform your car, then we are the place to come. We can’t promise to make it drive like a Rolls Royce, but we can promise that a personalised number plate can make you feel that little bit more excited about driving it.